October is “Breast Cancer Awareness” month. First State Bank is partnering with our friends at Eastern Wyoming College to honor this cause by having a “Pink Day” on Tuesday, October 2nd. A limited number of pink shirts will be available for a goodwill donation at the EWC women’svolleyball game vs. Western Nebraska on Tuesday night at 7pm. All admission receipts at the gate , EWC’s portion of the 50/50 drawing, and any raffle receipts will be donated to Beta Sigma Phi Alpha Alpha. These funds are made available to Goshen County residents to help maintain breast health. The Community Hospital Mammography department will have brochures and displays in the lobby of the gymnasium that evening and will be available to answer questions concerning breast health. The first 150 persons will receive a pink embroidered lapel ribbon compliments of EWC Health Technology and the EWC Athletic Department. All attendees are encouraged to wear pink with the Lancer volleyball players. The Central Rocky Mountain Region rodeo is in full swing with the rodeo at Chadron State College this past weekend. The men’s team tied for 3rd with 280 points and the women’s team placed 8th. Eastern Wyoming College sophomore Lane Hall, Winner, SD, placed 1st in Saddle Bronc riding with 74 points. Sophomore, Tyler Thorson, Towner, ND, placed 2nd in Tie-Down Roping with 22.2 seconds on to rounds. Other members placing on the men’s team were team roping duo’s of Tyler Wortman, Highmore, SD, Cotey Hanson, of Berthold, ND, Troy Wilcox, Red Owl, SD, and Trae Kautzman, Walcott, ND tied for 3rd place. Alexandrea Grant, freshman, Wheatland, WY, finished in seventh place in the Break Away Roping. “The men’s team had another good rodeo. We are very consistent. The women’s team showed a lot of progress. We have a lot of young athletes who are doing very well” said Coach Clark. The Eastern Wyoming College Men’s rodeo team finished the weekend in third place in the team standings at the Central Wyoming College rodeo. The EWC team finished with 390 points third behind U.W. who earned 625 points. In the tie-down roping, Troy Wilcox, sophomore from Red Owl, SD, finished the weekend in 2nd. He was second in the Men’s All-around. The team of Wilcox, and Cotey Hanson freshman, from Berthold, ND were second overall in the team roping. Shane Suchy, freshman, from Tryon, NE and partner Logan Macomber, sophomore, from Arthur, NE were 4th. Trey Fortune, sophomore, from Milesville, SD, was 2ndin Saddle Bronc Riding and Joe Bertus, freshman, from Avon, SD was 2ndin Bull Riding. “We are off to a great start.” “We are learning and getting better each week,” said coach Jake Clark. The rodeo teams will next travel to Chadron, NE for the annual Chadron State College rodeo. 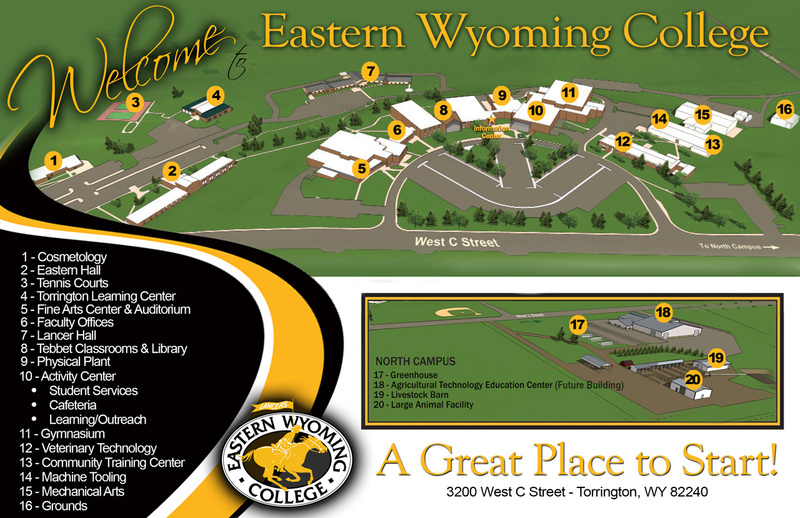 EWC played host to the 2012 Wyoming State FFA Veterinary Science competition on Wednesday, September 12, 2012. Fifty FFA Members from 10 Chapters across Wyoming participated in the event. The competition consisted of a written test on 9 areas of animal and veterinary sciences, plus sections of animal breed identification, veterinary equipment identification and animal parasite identification for each individual. In addition to individual competition, each team was given a scenario to develop a written response with facts and options to improve an animal care and ethics issue in the United States. The Chief Washakie Chapter from Worland and Casper Chapter earned the opportunity to represent Wyoming FFA at the first National FFA Veterinary Science Competition in Indianapolis, IN during the 2012 National FFA Convention, October 24-27. Results from the Individual competition: 1st– Seth Peterson, Chief Washakie Chapter; 2nd – Ty Carpenter, Jim Bridger Chapter; 3rd – Kaylen Lewis, Casper Chapter; 4th– Danae McGarvin, Chief Washakie Chapter; 5th – Tevin Smith, Casper Chapter; and 6th – Lacey Packard, Casper Chapter. Teams Results: 1st – Chief Washakie Chapter (Worland); 2nd – Casper Chapter; 3rd – Jim Bridger Chapter (Mountain View); 4th – Burns Chapter; 5th – Southeast Chapter (Yoder); and 6th Devils Tower Chapter (Hulett). Other Chapters also participating were Newcastle, Wheatland, Frontier (Cheyenne) and Torrington. The Eastern Wyoming Fine Arts Council will present the Glenn Miller Orchestra “The Sound Lives On” Sunday, September 23, 7:00pm in the Eastern Wyoming College Fine Arts Auditorium. Ticket prices are $20 if purchased by September 21 and $25 at the door. The Workforce Development Center at Eastern Wyoming College is now accepting registrations for a CDL course to be held in Torrington. This course will begin October 15th and run through November 2nd, Monday – Friday, 7 am – 5 pm at the EWC campus located at 3200 West C Street in Torrington. The registration deadline for this class is October 3rd. To begin the registration process contact the Workforce Development Center at EWC at 307.532.8365 or by email at workforce@ewc.wy.edu. Eastern Wyoming College’s Adult Basic Education program announces that GED graduate Lanay Shippert, of Glenrock, WY received the 2012 State Merit Award for ABE students at the ABE Fall Institute in Lander on September 12. Lanay left high school in 1934 to marry her sweetheart. They went on to raise four children together. Between 2004 and 2011 she lost both her husband and a child due to illness. Her oldest daughter married before graduating from high school and went on to earn her GED. It was during this process that Lanay, with encouragement from her daughter, began thinking about getting her GED. She enrolled in the EWC program in September 2010 but had to put it on hold to take care of her husband when he became ill. She then enrolled again in August of 2011. Lanay’s accomplishments were recognized in several ways. She was the EWC ABE Student of the Month in March 2012, was inducted into the National Adult Education Honor Society and was the guest speaker at the GED graduation ceremony held in Douglas. “We are very proud of Lanay and feel she is very deserving of this award” said Diane McQueen, EWC’s ABE Director.